At northern plain of Nasca, Peru, there's a village called ICA which is a museum of ten thousands mysterious stone. These stone was carved with a story of ancient human civilazation. Unbelieveable but true, these stones showed that an advanced civilization of ancient people. these stones is called the inscription of ICA. According to local media, many of these stones were found after the dam at ICA river broken down. there 're the images of galaxies, ancient animals, ancient continents, ancient catastrophes and etc. chemical test showed that these stones originated from Mt. Andes. with these stones, there're fossil of organism lived thousand years ago. If we referred to the stones carved object, They showed an advanced civilization such as organ transplantation operation, blood transfusion, telescope, medical tools, man chasing dinosaurs and many images that could not be explain by scientists nowadays. from these stones, we can see the relationship between dinosaurs and man. man are carved much smaller than dinosaurs but the dinosaur looks tame and friendly with human. According to scientists, dinosaurs had extinct hundreds thousands years ago. Why can human lived together with monster such as dinosaurs? 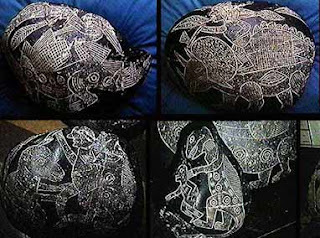 besides that, Dr. Javier Cabrera, the owner of these stones, said that these geological people knew that there's a more advance civilization outside earth. They have a unusual but great technology, they need not use energy source like we are using right now but they can travel among stars. Among the stones, there's a images of earth from sky at 13 millions years ago. there are four pictures and looked like the world map. The plains carved there is the ancient plains. The mysterious land of Atlantis also en carved in the stone.